Easily creates a copy for your client and one for your records. 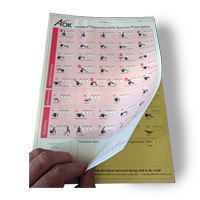 Each exercise on the mediBall®Dynamics DVD is referenced - it is the same sequence as the mediBall Wallchart. Great for health and fitness professionals wanting to prescribe exercises for clients and patients.